You exchanged it for money. When you sell me an apple, that apple becomes my property. Once you’ve sold the apple to me it is mine. I don’t care how much effort you spent growing that apple, You give up your right to control this apple because it is no longer yours. You exchanged it for money. Now this apple of mine I will share it if I want to. I will even COPY my apple (i.e. throw it in the replicator from Star Trek) then share the copies to starving children. It becomes none of your business what I do with my own apple. This is how property rights work in physical objects. Information cannot be property. COPIES can be property. What about property rights in copies of information? If I modified the code in your copy of a game (as opposed to doing it to my copy) without permission, would that be okay? I am exercising control over your property without your permission (a right which is reserved ONLY for the property owner). We know that this is not ok, because not only is it trespass, it is also a form of vandalism and a breach of privacy and is not to be tolerated. Now contrast with this scenario: Say if I purchased a copy from you… what if, I take this copy, I go to my computer and make modifications to it. Would that still be trespass or vandalism? Not at all! Because me modifying my copy affects only my copy. Your copy is unaffected. Even if I upgraded my copy to version 1.1, YOURS IS STILL AT VERSION 1.0! That is why no conflict occurs over the use of property, each exercises control over their own copy. This is how property works. Property rights is absolute morality. We all know Don’t steal. Don’t hit. Don’t trespass property. Don’t exercise control of what isn’t yours. And so it is even with copies of information. Don’t veto my use of my copy if you’ve exchanged that right for money. Just like the apple, I will share my copy if I want to because that’s MY PROPERTY. The amount of time & money you spent developing it is rather irrelevant because you exchanged the right to control THIS COPY for a sum of money. Can we prevent our customers from making further copies of the pictures we’ve sold to them? Why should I have the right to veto what others can and cannot do with their own property? 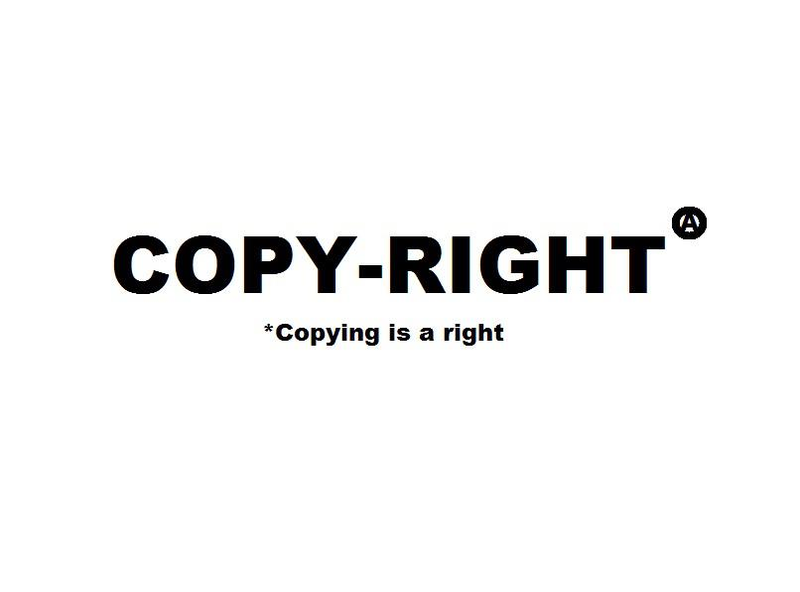 Now as a society we can agree to give up certain rights to our own property in order to promote the progress of learning, hence why copyright was invented [see Statute of Anne & post]. Copyright is the limited time, limited suspension of the PEOPLE’S RIGHT to COPY. Copyright is merely the ability to use the State’s branch of coercion to veto what your own customers can and cannot do with their own property. Falkvinge calls it a ‘monopoly’ because mechanically it is one. It is a monopoly on the Ctrl+C, Ctrl+V function for one particular piece of information. (history reveals copyright as coercive monopoly read your history books.) Even the US Supreme Court calls it that. Again, this isn’t a right being granted to the holder, he is permitted to perform the work as he sees fit. If I’ve paid you to write me an article, I expect to be able to share it. If I’ve paid you to draw me a picture, I expect to be able to share it. If I’ve paid you to make me a game, I expect to be able to share it. If I’ve paid you to make me a film, I expect to be able to share it. If I’ve paid you to code me some software, I expect to be able to share it. Then 3) The free market will work to bring these two groups of people together (through entrepreneurship and innovation). IIPSJ: What if social justice was a song with a copyright? What if social justice was a pill that was patented and could save the lives of millions of people, but it never reached those people because they are poor? What if social justice was a song with a copyright, but the people who created the song couldn’t sing it without paying someone else? What if social justice was a trademark, but it was used on products to pollute urban communities and oppress the poor? As our world becomes ever more dependent upon technological and scientific developments, we will be forced to engage issues of access. In addition, we will be charged with giving inventors, artists, and entrepreneurs the tools to exploit the economic value of their creative works and inventions. This is the work of IIPSJ. Jérémie Zimmerman: By sharing, you’d be better cultured. Julian: You’d be a criminal. Jérémie: No! You’d be better cultured. Jérémie: No that’s (just) their story telling! Andy: The history of the human race, the history of culture is the history of copying thoughts, modify and processing them further on. Julian: Ever since the 1950s we’ve had industrial culture. Our culture has sort of become, industrial products. Jérémie: And when it is about sharing of culture it is exactly the same as when it is about the sharing of knowledge. We have examples of where, decentralized services and the sharing between individuals, makes things better. Jérémie: (And then) an industry comes and says, “Oh this is stealing and this is killing everybody, killing Nazis, killing Hollywood, killing cinema, killing kittens, and everything. Some conservative members of the European Parliament today they now Understands this. Understands that when individuals share things, they share files without a profit, shouldn’t be enforced, shouldn’t go to jail, shouldn’t be punished. Also see Is Neelie Kroes Implicitly Calling For Your Assistance For Copyright Reform? Karl Fogel: How can you have ‘libre’ without ‘gratis’? “Intellectual Property” law is not an inherent natural law, it is a “product” of human design, it wasn’t here “before the beginning of time” like property was and we just had to articulate it and write it down as a law. Unlike real physical property law, it was designed by a few people and then forced upon the rest of us. The fact is that property exist even among animals, they can’t articulate (they can’t talk) they certainly can’t understand it, but try to take something away from a dog… he will defend it because it is his property. The same was true for us. Before we evolved into homo sapiens, our ancestors started to live in groups (the predecessor of society) and they couldn’t speak, they couldn’t articulate their “thoughts”, but they already had the concept of property because that was the only way to achieve a peaceful coexistence. If something was scarce and rivalrous, it was a designated an owner and it was shared only under the “blessings” of this owner and that it can be exchanged for other property and they did this even though they didn’t understand any of the concepts behind their actions. We consider theft a crime, not because of the “ten commandments”, not because the “people who wrote the law” said it shall be like this, but because it was a law long before we could articulate such a thing as law much less write it down on paper. This is why we tolerate and (most of us) accept the confiscation of unlawfully obtained property because it doesn’t disrupt the peace it actually makes the peace more stable. This is why the majority of the internet does not accept “Intellectual Property” (even though they say they do), this is why there are so many “thieves” out there downloading music, movies, books, software. These people are doing it because they “know” it does not disrupt the peace, they “know” it is something we can do without injuring another individual, and if we injure nobody then we are not disrupting the spontaneous order and consequently we are not disrupting the peace. When a large majority of the population doesn’t care for some “law” and/or they care about it only because of severe punishments, it is not law at all, it is just some bad and counterproductive command from the “authorities” forced on us in order to serve the interests of some groups at the expense of other groups. Real laws are those respected by the large majority even without the threat of punishment from the government – only a small minority (the criminals) need to be forced to respect a real law, that is why we call it law, because the large majority “know” it emerged in order to save the peace, not designed in order to serve somebodies interest. Awfully well put Aaeru, even to the extent that I’m certain all politicians Worldwide currently bribed by “the industry” to pass more unjust, antisocial laws would understand why what they’re doing is so wrong on so many different levels. This outright corruption by the entertainment cartel MUST now cease because we, the people, require the freedom to share without penalty and without restriction. The “industry” must now adapt to modern needs and demands or die and be replaced with those who understand the new economic and technological reality of today. I don’t expect people to write for me for free. “Readers don’t expect you to work for free, they expect to be free to share and build upon the work you have given or sold to them, just as people expect to be free to share and build upon Shakespeare’s work. I expect to be free to share and build upon Stephan Kinsella’s blog posts. I’d also expect to be free to share and build upon any articles I might pay him to write for me. I certainly don’t expect him to write for me for free. No doubt if enough of us club together, we could share in commissioning Stephan to write something erudite for us, e.g. “Intellectual Work in a Free Market”? Naturally, we’d expect to be free to print and share or sell copies of this ad infinitum, whether hardback or e-book – without having to pay Stephan a penny. This is the difference between paying someone to write and enjoying one’s natural right to copy a book one has purchased – a natural right annulled by Queen Anne in 1709. In 1708 people were free to make copies of an author’s published works. In 1710 they weren’t. Cory Doctorow: The unfettered access to human knowledge improves us and makes us better. If you could reproduce hot lunches at will with no incremental cost, no one would characterize that as a disaster, except perhaps the delicatessen industry. But today, where human knowledge can be reproduced at no incremental cost, our first response is to see to it how we can make that stop?? Human knowledge has through history been the prime factor that drives the human condition, our ability to enjoy our lives. The unfettered access to human knowledge improves us and makes us better. Crosbie Fitch: people have a natural power and right to share and build upon the cultural and technological works they have. “There is nothing a priori WRONG with infringing copyright.